Sonic Boom seems like the perfect game for men that enjoy big powerful toys. 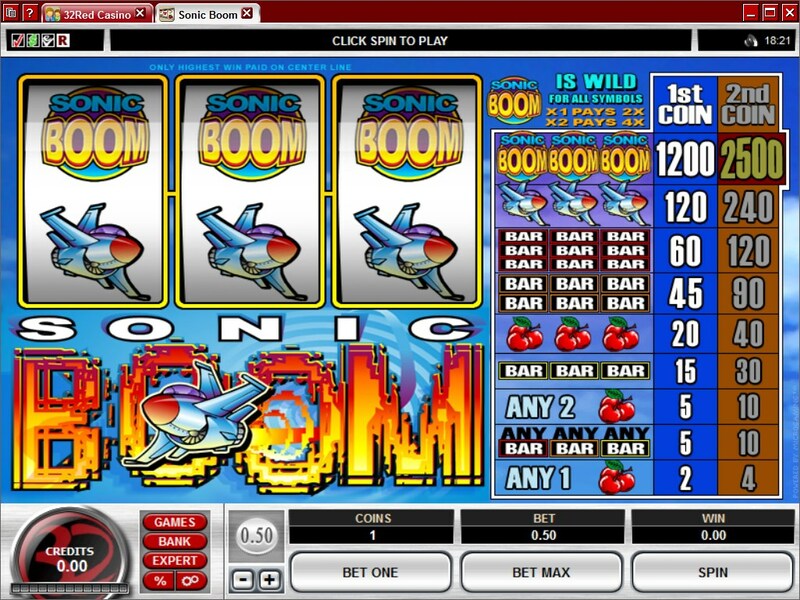 I’m talking about a slot machine which is themed around military aircraft that can go over the speed of sound, the result being the sonic boom that the game’s title mentions. The game has a good list of features as well, but I still think that the best thing about it is the fighter jet inspired design. The game is one of Microgaming’s and it’s a classic title. 3 reels are used in Sonic Boom, with 1 win line on them. The wild symbol and its multiplier are the two main features, while the big prize is valued at $12,500. As many other classic slots do these days, Sonic Boom also comes with some good features, though it doesn’t go overboard with them. All you get is a wild symbol, but it has a multiplier that can make payouts be up to 4x bigger. A Sonic Boom Logo serves as the game’s wild. It’s also the symbol which forms its own combinations, paying 2,500 coins when three of them are on the same line, during a round with a 2 coin wager. When used as the wild, you can get a new combo with its help in one of two ways. You can get one wild symbol with two regular icons that match, or you can get two wilds with one regular icon. In the first situation, the multiplier used on the win value will be at 2x. In the second situation, you get a 4x multiplier. Like many 1 line slots, it uses a maximum of 2 coins. You pick how many should be part of the wager and what their value should be. The range is between $0.05 and $5 for one coin, so up to $10 can be the maximum bet. With 2 coins being part of the wager, a combo of three wilds will reward you with 2,500 coins, or as much as $12,500. Thanks to the blue skies used for the background picture, and the presence of the aircraft jet both among the symbols and in the logo area, you actually get the feeling that this game is indeed themed around airplanes. It’s not the case in many other slots, but Sonic Boom does a good job with its design and it’s actually pleasant to use. You can’t say that about a lot of other slots. Sonic Boom uses the same classic icons for the lower paying symbols, but the top two are themed. Symbols: Sonic Boom Logo (2,500 coins, wild), Aircraft (240 coins), Three Bar (120 coins), Two Bar (90 coins), Cherries (40 coins) and One Bar (30 coins). I for one enjoyed the theme, and that’s the main reason why you play a game like this one, whose features and prizes are the same as in dozens of other titles. If aircraft jets are favorites of yours as well, you should play the game. 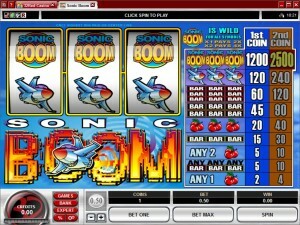 This Sonic Boom slot is offered by all online casinos with Microgaming software, playable either in practice or in real money mode.